L2S » Guides » Webinars » Building a Successful Online Business! 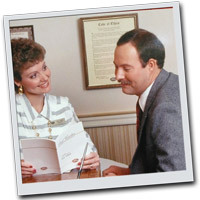 I’m Bruce Eckman, Founder of EZ-NetTools Incorporated. You know, I must have been born with small business in my blood. I started my first business when I was just five years old! Over the years I’ve started and worked in over a dozen different companies and worked on the board of directors of several organizations. For the past 17 years I’ve worked with thousands of small and home based businesses, to help them be more successful on the Internet. A few years ago, There was a high school girl. She went to her dad and told him she wanted a car. He thought for a moment and replied, “Get a job”. She thought about it for a while and then came back to her dad. She said “Dad, I want to start a business. Will you help me?” So the dad helped his daughter start a home based business selling horse riding gear online using EZ-NetTools. I used to, once a week get a report of the “Top Companies” on our system and on that report, I noticed this “horse riding gear company” rising toward the top on my list. I like to call these top companies and find out what they are doing, so I can share that information with our other customers.I called the dad and he told me their story. He said his daughter’s business was doing so well that she could buy a new car every month if she wanted to. I said “I hope your not letting her buy a new car every month!” He said “No, the money is going into saving for college”. I called him back a couple of years later to see how they were doing. They were still on the top of my report. His daughter was now in college. The dad had quit his job and was now managing their successful business full time! They had several warehouses, quite a number of employees and manufacturing overseas. They were doing very well. Now, I don’t want you to get the wrong idea. Some people get what I call “The money tree mentality”. They want to “Get rich quick!”. If there is one thing I have learned, that is : Success takes hard work, knowledge and lots of patients. The Internet provides a unique opportunity that has never been available to small and home based businesses before! It’s huge and growing rapidly, giving you access to customers all over the globe. Over a billion people use the internet! It’s interesting to note that Internet users spend twice as much time online as watching television! People spent over $197 Billion dollars online in 2011 and rapid growth is expected through 2015. So, why is now a great time to start an online business? There are two quotes that I really like and believe are true. The first is that Problems create opportunities! The second quote is Every black cloud has a silver lining! We’ve seen stocks fall and prices rise. We’ve seen layoffs and companies fail. Looking down the road to the future can seem a little bleak. So, where is the sliver lining in this economy? When this economic crisis started, we noticed something strange. We host several thousand websites for our customer and we noticed a huge increase in their website traffic… and a huge increase in online orders. Over a 25 percent increase in just one year! We thought “is this happening just to our customers”, or is this happening all over the Internet. We searched the news and found story after story like this one. People want to save money. So, what better place to shop around and compare prices than on the Internet. Many stores have reduced their inventories to compensate for lower sales. This generates fast cash for them, but reduces selection for the customer, thus pushing them to the Internet where the selection is really growing. And people really like to shop any time they want! Your online business can be open 24 hours a day, 7 days a week! Several years ago their was a huge blizzard in the east. Researchers noticed that during the blizzard, Internet use and online shopping skyrocketed. The more we stay home…the more we shop online. Higher fuel prices translate directly into online sales! I believe that right now the Internet is providing a huge opportunity for those who want to roll up their sleeves and go to work! So, how can you take advantage of this opportunity? If you have an online business make sure it’s working. If you don’t have an online business … start one! Now, I would like to introduce you to our “Launch2Success” internet marketing training. We want to provide you with the training and tools to help launch your online business to success! We’ve developed a series of powerful trainings that will provide you with the “how to” make your online business a success. Each training is presented with video, audio and printed information. Other resources and links to online tools are also provided. This is a incredible training course, covers a wide range of topics. Tips, hints and down to earth information that will provide you with what you need to know to make your business work. And best of all… it’s totally FREE! Be sure to visit launch2success.com and see all the resources that we have available. If you haven’t done so already, sign-up and launch your online business to success!